As a kid, I thought TV dinners were great. They came in this handy tray filled with yummy things like chicken nuggets and french fries in their own compartment. Now days, I’m less of a fan, but I still appreciate the convenience a frozen meal offers. We have the best intentions to cook dinner, but sometimes life gets in the way and you find yourself struggling to make your planned meals. This happened to me a few weeks ago and my freezer was not stocked with homemade frozen meals, unfortunately. So to the displeasure of my waistline and budget, I picked up takeout and fast food instead. Now that things are a bit more settled down, I’m rebuilding my supply of frozen meals. These meals are truly lifesavers. Even on your busiest days, you can spare a few seconds to grab an entree out of the freezer and put it in your refrigerator to thaw while you’re at work. It takes a bit of planning, but a well-stocked freezer can help you save money and still eat healthy on those crazy days. Seems obvious but not every dish will freeze and/or reheat well. The dishes that tend to do best include soups (but not cream-based. Add the cream when you reheat the soup), casseroles, meatballs and sauces (pizza and spaghetti). Homemade bread, muffins, pizza dough or rolls also freeze well. You can also make your own frozen vegetables by blanching them first, then freezing them. With casseroles, I recommend freezing it in the dish you plan to reheat it in. It can be stoneware or glass or a disposable aluminum pan. If you use ziploc bags to store food, make sure you use freezer bags over regular storage bags and heavy duty aluminum foil to cover casseroles. The enemy of any frozen dish is freezer burn, so make sure you get as much air out of the container or bag as possible. Always make sure to label your entrees and date them. Frozen foods don’t keep forever, so you want to make sure what you eat is still safe and to always eat the oldest dishes first. Additionally, I suggest creating a checklist, so you know what’s in your freezer at all times. Now you know what needs to be eaten and when you’re getting low on certain dishes. Some like to set aside an afternoon on the weekend to make their freezer meals. Others like to double a recipe whenever they make a freezer-friendly entree with the intent to freeze the leftovers. Or you can turn it into a party and invite friends over to cook up a storm together or to bring a dish that can be frozen to share with everyone. Whichever method you use, just be sure to follow my above tips to create a freezer full of budget-friendly freezer meals. Pasta is one of my favorite dishes, so it makes me very happy that it is such a freezer-friendly ingredient. This dish is incredibly versatile. You can change the veggies to suit your family’s preferences and can leave out the meat to make a vegetarian version too. 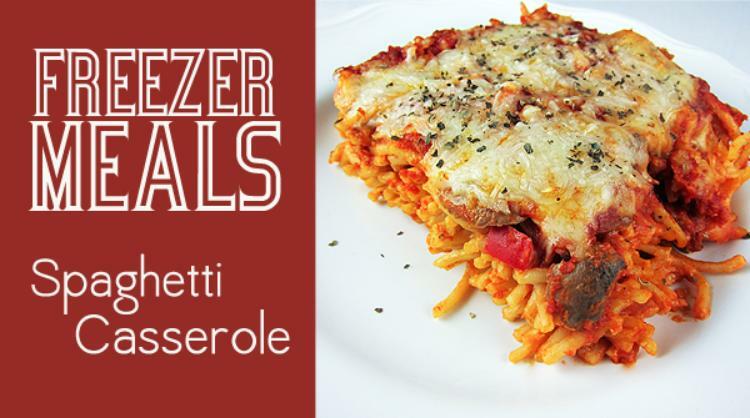 Paired with a salad and a piece of garlic bread, you now have an easy and quick dinner that your whole family will enjoy. Preheat oven to 350 F degrees. Lightly spray 2 (8×8) pans with non-stick spray. Set aside. Meanwhile, in a skillet, brown Italian sausage over medium-high heat until fully cooked. Remove sausage and place in a small bowl. Drain off most of the fat in the pan, then add onion, mushrooms and red pepper and cook until softened. Once spaghetti is al dente, remove about a cup of pasta liquid and set aside. Drain spaghetti and place in a large bowl. Add softened cream cheese, cooked veggies, garlic powder, Italian seasoning, red pepper flakes and salt and pepper to taste and stir until noodles are fully coated. If the mixture seems a bit dry, add some of the pasta liquid. On the bottom of each 8×8 pan, spread a few spoonfuls of spaghetti sauce. Place half of the spaghetti mixture in each pan. Top with half of the sausage on each pan, then cover with a generous amount of spaghetti sauce (about a jar and a half of sauce). Make sure the noodles are fully covered. Sprinkle two cups of mozzarella cheese over the pan you plan to eat now and bake for 20-30 minutes or until bubbly. Serve immediately. I wait to add cheese to the pan I intend to freeze. Cover with heavy duty aluminum foil and refrigerate until completely chilled, then move to the freezer. When you’re ready to reheat, thaw the casserole in the fridge while you’re at work, then bake at 350 degrees. After about 20 minutes, add 2 cups of mozzarella cheese and continue baking until the cheese is melted. I found one jar of spaghetti sauce wasn’t quite enough for me, but two jars is a bit too much. I freeze the leftover sauce to use the next time I make this dish.